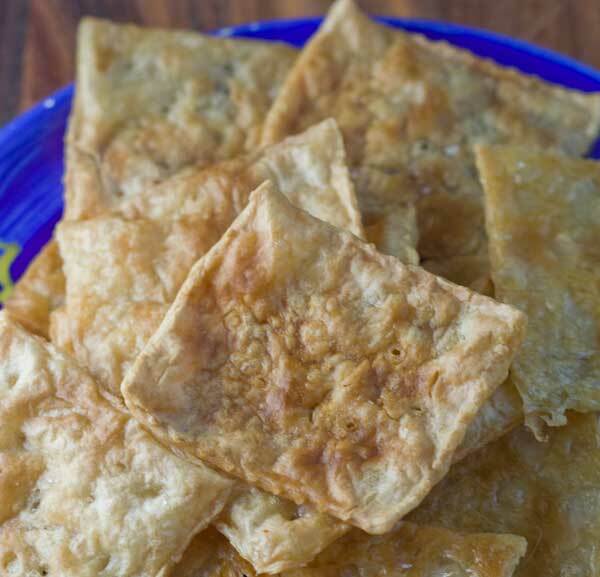 An old recipe where Saltines are soaked in water and baked. Preheat oven to 425 degrees F. Line a large baking sheet with nonstick foil or parchment. Fill a 9x13 inch (ish!) pan with about 1 inch of very cold water. Put the Saltines in the water one by one, doing your best to cover them with a little water without breaking. Let the crackers sit and soak up water for about 10 minutes or until they become slightly waterlogged. With a slotted spatula, carefully lift the sopping crackers up, one by one, letting water drip out through the slots in the spatula. Try to keep the crackers from falling apart. Arrange the crackers side by side on your baking sheet. With a grater, grate some cold butter into a pile. I did this over a sheet of foil. Put a small (about 1/2 inch across -- see photo) pile of butter flakes in the center of each cracker. Bake the crackers at 425 on the center rack for 12 minutes. Reduce heat to 325 and bake for another 22 to 30 minutes (check at 20) or until crackers are golden brown and seem crisp. Remove from oven and let cool completely. While they are cooling, sprinkle with a little coarse salt. If you’ve used salted butter, you might be able to skip the last bit of salt, but I used unsalted butter and felt the crackers needed it. This is a small batch to get you going. After you get the hang of making these and figure out the perfect timing in your oven, you might want to double or triple the recipe.